"Yeh Rishta kya kehlata hai" written Episode on 19 July 2018: "Naira coming back"
The episode of Yeh Rishta kya kehlata hai starts with Surekha saying is Kartik don’t worry. She will explain Mansi Natik calls Kartik. He informs Kartik ” I am getting back “. Kartik thinks to Naira . He says Natik returns to Udaipur. It means Naira will be alone. Manish saying is ” why is Naira alone”. Kartik says Natik coming back. Kartik sounded upset. Manish says why are you upset? Kartik says everyone upset. Manish says you both love each other. He tells when you are getting the divorce, I can’t believe this. Naira cuts the cake. Everyone claps. Naira says” I always remember that”. I started feeling good staying here. Kartik says I will miss you. Kunal says to Naira I troubled you and I call you aunty, “I really sorry” Naira says is its okay. She said that I miss all. Next day, Kartik jogs to park. He thinks of Naira. He says why am so worried about her. Kartik thinking about it. Naira sees Kartik inside the park. Bhabhimaa and Divyaani waiting for Naira. Bhabhimaa says ” this is Naira’s maayka. She saying is I wish Naira go to our sasural. Devyanni sees Naira coming and she keeps a smile. Naira asking both don’t happy because I am back. Bhabhimaa saying I am very happy. You coming back. Naira says I can’t see your tears. Bhabhimaa tilak to Naira. Devyaani says to Naira looks on the mirror. Its a ritual, one should see the mirror and look behind to know if the decision taken was right or wrong. Naira saying is ” I see Kartik in the mirror”. Kartik comes to the home. Kartik saying is suwarna “how is she” she take medicine. Suwarna says ” yes” I take a medicine. Kartik says where is Mansi. Suwarna Mansi is our room. Kartik says Mansi is upset. Suwarna says I arrange the lawyer. Kartik calls to Naira. He said is Naira please heard. Kartik tried to find out the real reason behind her coming back. Kartik feels sad and he is very upset. Suddenly call disconnected. Naira feeling sad and she is very emotional. She sees Akshara’ s pictures and talks to herself. She said that I am the right thing. Moving away from Kartik. Naksh says Natik Thanks for coming back. Suddenly Naira meets Anmol. Anmol comes to Naira and hugs. Kartik asks Mansi to talk. Mansi says when you are getting divorced. Both of them tell Naira and Kartik about wanting to marry someone. But refuse to name them. 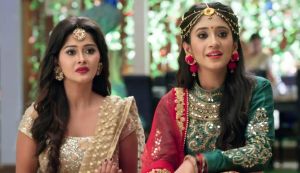 Naira says Anmol and Kartik say Mansi both says convince their respective families about the same. Rukmani says Naira to Manage everything. Everyone goes to meet the girl’s family. All goes to singhanias mention and meet get shocked.